As previously mentioned, the tip of the exhaust was bent (and unfortunately the bumper slightly) on the 02 during delivery. 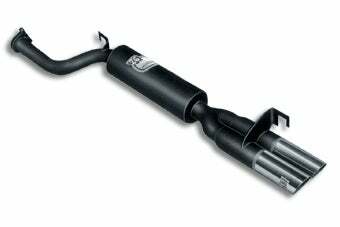 Since I’m still waiting for the US title and PA tag, I figured that now is a great time to upgrade and install a new muffler. The car’s first stop after I enjoy it for a few weeks will be for inspection and to get the carbs tuned up (which it makes sense to have the new exhaust installed for anyway.) I also just got a raise so ya know TREAT YO SELF. It’s an ANSA Sport. The car already sounds amazing, but this should put the icing on the cake and give it a little nicer look w/ a second pooper and the angled cut. I don’t normally post at night time. So if you’ve missed the saga. I bought and imported a 1975 BMW from Holland. It’s a 1502 with an engine from an 1802 and a ton of mods.